Nowadays, you don't have to go to the cinema to see a film because you can also do this at home. iTunes has become the second cinema for us to enjoy popular movies. All kinds of movies are provided on iTunes Store and what you need to do is just to download and play it on your computer - of cause you need to pay for the movie first. Most iTunes users wonder if they can put the movies downloaded from iTunes to their Android devices or other video players. And to our disappointment, Apple prevents us from transferring them to other devices except for Apple devices. In this review, we would like to focus on five pieces of DRM video converting software. All software reviewed below can be used to remove DRM from iTunes videos. For each DRM removal tool, we will cover its conversion theory, main features, compatible OS, supported input and output formats, pros and cons, etc. with the intent to help you find the best software to get all your iTunes videos DRM free. NoteBurner M4V Converter Plus helps to convert iTunes purchased and rented M4V videos into DRM free MOV, MP4, AVI, MPEG, 3GP formats for playing on most popular devices, such as Motorola, Samsung Galaxy, Sony, Blackberry, Nexus, HTC, iPad, iPhone, iPod, WD TV, PSP, PS3 and more with original AC3 dolby 5.1 surround audio and subtitles preserved. Everything is designed for high speed, high quality and convenience. Key Features: iTunes DRM Remover + Video Converter + Video to Audio Converter. The Edge: Supports iTunes rentals and the excellent compatibility with iTunes and OS. Remove DRM 20X faster than traditional converter and keep original video quality. Preserve 5.1 surround audio channels and all subtitles. The Bad: Support iTunes DRM videos only. Aimersoft DRM Media Converter provides Windows users with excellent and full audio & video DRM removal solution. If you purchased several great movies from iTunes Store and now you want to play them on an Android tablet, you may have noticed that you cannot directly transfer them to your device due to DRM. Aimersoft DRM Media Converter legally removes DRM copy protection from WMV, WMA, M4P, M4V, M4A, M4B, ASF, etc. Key Features: DRM Remover + Video Converter + HD Video Converter + Audio Converter + Video to Audio Converter. The Edge: A host of optimized format and device profiles for choice, 6x conversion speed. The Edge: Includes 100 playback formats and an editor to customize settings for every at home and portable device. SoundTaxi can convert DRM protected music and movie files and various audio/video files to unprotected MP3, MPEG4, CD, iPod and other MP3 player file formats at high speed with CD quality. Key Features: DRM Removal + Audio Converter + Video Converter. The Edge: Output video/audio copy to iPod feature. The Bad: Very limited output video/audio formats. Pavtube ChewTune is a piece of easy-to-use and intuitive iTunes recording tool and converter software. It aims to help you make movies and music purchased through online stores free for different uses. The Edge: Supports 5.1 audio channels output in Apple TV profiles. The Bad: The Mac version is not compatible with Mac OS 10.8 and iTunes 11. As we can see from above, most DRM video or audio converters only run on Windows platform. For a number of Mac users, they also need to remove DRM from those protected audio or video files. Compared with Pavtube ChewTune for Mac, NoteBurner M4V Converter Plus for Mac has showed more obvious advantages with perfect compatibility with almost all the iTunes version and Mac OS. Besides, NoteBurner M4V Converter Plus for Mac supports converting iTunes rentals and keeping original 5.1 audio tracks & subtitles while ChewTune for Mac is not able to do so. According to the key features of above top 5 DRM video Converters, it is hard to immediately find out which one is better than the others. Each of them has its own advantages and disadvantages. Aimersoft DRM Media Converter seems to supports the most input file formats - almost all of the DRM audio and video formats are supported to be converted. But, the conversion theory would affect the converting speed and output quality. It is believed that the deciphering is better than recording mode with faster converting speed and higher quality of output videos. Thus, NoteBurner M4V Converter Plus for Windows is superior to Aimersoft DRM Media Converter in converting speed and output quality. Also, iTunes rentals can only be supported to convert by NoteBurner M4V Converter Plus. 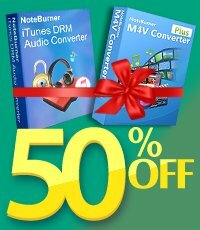 NoteBurner iTunes DRM Audio Converter is a professional and multi-functional iTunes audio converter, which integrates Apple Music Converter, Audiobook Converter and M4P to MP3 Converter together. It can convert DRM-ed M4P music and AA/AAX audiobooks to plain MP3, WAV, FLAC or AAC for better enjoying. The conversion speed is fast and the output audio is lossless. What is more, all ID tags are kept after conversion.